The other day I was sitting in the kitchen at work and mentioned something about taking our family photo for our Christmas card, and someone asked me why I send cards. It had never occurred to me to not send cards, but then I thought about my reasons why. It is a nice way to keep in touch. There are many people on our list that we only connect with around Christmastime with a card. With Facebook, etc. I sometimes feel pressured to keep up with everyone all of the time, but that is simply impossible. Sending a card lets the person know we are still thinking of them and that they are important! It spreads Christmas cheer. Getting a holiday card in the mail is exciting for the recipient. We don't get a ton of personal mail anymore so it is nice to get a card. It puts me in the holiday spirit. Like putting up the tree and hanging the lights outside, designing and sending our Christmas cards is another thing that is part of the holiday season. I love a good task like stuffing the envelopes, writing the addresses, and applying the stamp, and then seeing my progress. I like getting cards. So I can't expect people to keep sending me cards if I don't send any myself! It's a record of how our family has grown. I keep a copy of each of our cards since we started doing the photo card, and even though we only have four (this year is number 5), I will love to someday have a stack of cards to look through. It's an excuse to take a family photo. 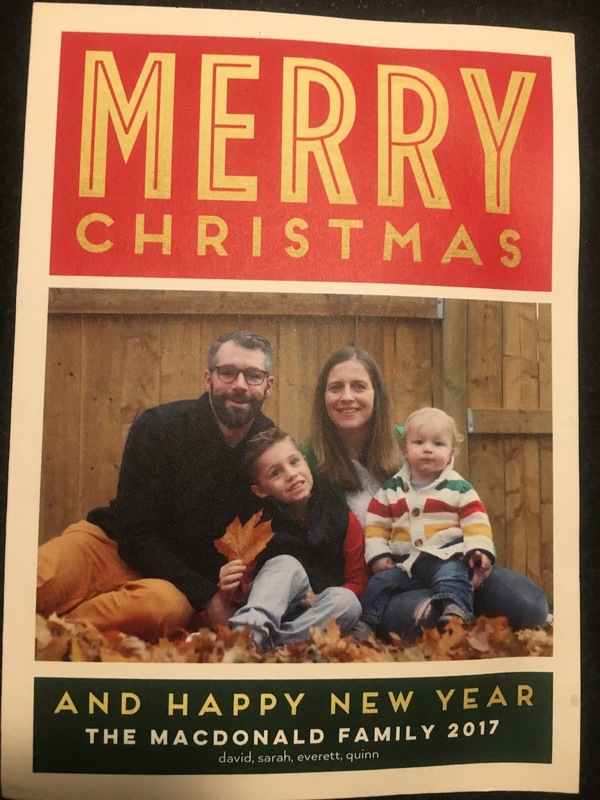 We take lots of photos, most of the kids, some selfies, but getting a photo for the card is a good reason to dress in coordinating outfits and all get in the photo. Last year's card - let's hope this year's makes it through the Canada Post strike! If you'd like to receive a Christmas card from us, send me a DM with your address. I agree with your first reason. Just yesterday I was discussing this with a friend who said since she never talks to the person other than at Christmas she figures no need to send a card. But for me that is a good reason to send a card, because you think of them and want to keep in touch even if only at Christmas. Memories of Christmases past or lives shared in your past. I, too, like receiving Christmas cards, notes, photos and Christmas letters.